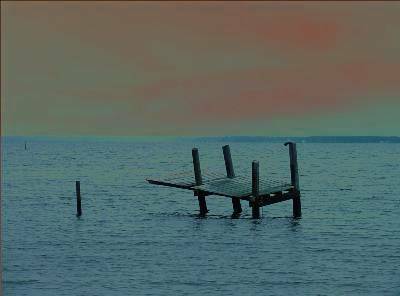 Taken near the North Carolina Outer Banks, what is left of a pier rests untill the next storm. Eeugh!! Sorry, but I really don't like the color adjustment that you've done on this. Color adjustments should be subtly used to draw highlights or achieve a look that's better than original - I daresay the original would have looked better. Interesting photoediting. Although it kinda follows the rule of thirds, you still have the horizon about in the middle. nice, surreal shot. love the colors and the solitude. kinda looks like a dog fetching a stick. heheh. The post-edit work here is interesting. But I think you may have overworked the image and taken away from it's orginal form. Also, horizon line is dead center. I should be either top third or lower third...and finally, the main subect shouldnt be so close to the center. OK, like I know what I am talking about.....hahahahaha. Good effort. Just me being a pain in the rear fender. GL. Holds my interest in some ways, I like the stark nature, but the unnatural colour cast doesn't work well for me. The color of the sky looks fake. Like how the pier is shattered. I don't sense calm here it looks ready to fall any minute. The colors are beautiful. Colors are interesting, I like how it is just leaning. Proudly hosted by Sargasso Networks. Current Server Time: 04/26/2019 07:40:14 AM EDT.